Now with three goals in his last six Championship matches, the form of Marco Stiepermann has been a massive positive for Norwich City of late. Operating predominantly in his number 10 role, the versatile Stiepermann’s been an instrumental figure towards Norwich going 10 games unbeaten in the league and done a fine job of filling the void left by James Maddison’s departure to Leicester City. Indeed, manager Daniel Farke recently touched on the latter point by commenting: “Last season we had James Maddison in that position, who is also a decent player as well. He could have played with James but he has now brought himself to a situation where he is fit and has adapted to the nature of the Championship, and that is why he is performing on this top level. Despite his towering size, which makes him a fantastic outlet for goal kicks, crosses and any sort of dead ball situation, his work with the ball at his feet and his intelligent movement have been the standouts. Possessing a crisp first touch, sharp ball control and a nice array of body feints, shimmies, unbalancing touches and skills, the German has proved a very hard man to dispossess. So good in 1v1 duels, where he’s constantly got the better of his adversary to either breeze by them or provoke a pressing action to create a free man or open a passing lane, his composure and press resistance have been outstanding. Combine this with his hulking strength and decent mobility, which allows him to hold up the ball expertly or spin away from his man, and this only amplifies his effectiveness. 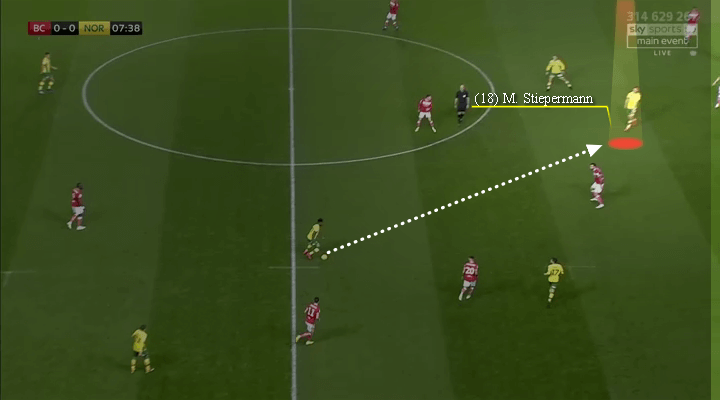 The former Energie Cottbus and Borussia Dortmund big man notably supplements the afore with his coherent passing, something he uses nicely to connect, construct and animate his team’s passing phases. Adept at executing his passes while under pressure over short, intermediate or long distances, he usually makes the ideal selection to deal with whatever predicament he finds himself in. With an eagle-eyed vision to oblige his teammates’ runs in behind, plus the quality to play incisive line breaking passes, partake in intricate link play in close quarters or recirculate the ball, he’s moved the ball with clarity. Tying everything together ideally with his smart movement, the 190cm midfielder’s aptitude in this regard has served both he and his team brilliantly. Granted plenty of positional freedom to support attacks from his nominal attacking midfield post, he’s done so with aplomb. To start with, he’s drifted into wide areas and the half spaces to help support wing attacks by creating numerical and positional superiorities. In addition, the way he’s dropped deep into true central midfield locations has manufactured important overloads in his search to connect passages while also frequently drawing one or more markers to generate openings behind him. Seeing as Norwich are so fluid with their movement in the final third, the 27-year-old has been a key cog in rotating with his fellow attackers, which successfully destabilises backlines by causing moments of indecision on who should mark who. Interestingly, Stiepermann has opted to check deep towards the halfway line in behind either fullback, with this giving him the opportunity to receive the ball away from the congested middle. By doing so, he can therefore orchestrate and dictate play under minimal pressure to pinpoint a colleague with an enhanced field of view. While this lessens his side’s presence in the 10 spaces, it’s still is a concept that’s proved fruitful. By the numbers, his 2.1 key passes per game, 2.1 won aerial duels pg, 3.4 dribbles pg, 1.83 progressive runs pg and 1.04 shot assists pg aptly depict his offensive value. Ambitious, progressive and always keen to create advantageous conditions for the Canaries, the multifaceted German has been an integral component towards Farke’s team’s excellent start to the crusade. Even though he hasn’t been completely flawless, there’s no doubting how important the ingenuitive Stiepermann is and will continue to be for Norwich’s chances of promotion back to the Premier League. Can this German native help Norwich City get back into the English Premier League? Lock your football picks and other sports bet at Easbridge sports betting brokerage’s Skype Betting service or through VOdds trading platform!